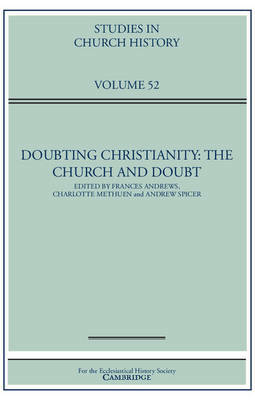 The fifty-second volume of Studies in Church History explores the myriad ways in which doubt has tested Christianity and the life of individual Christians. Men and women have always had doubts about ideas, or individual doctrines, if not faith itself; they have also doubted how truth can be authenticated. The means and the implications of expressing either kind of doubt are shaped by historical circumstance. Led by scholars including Kirstie Blair, Janet Nelson, Charles Stang and Rowan Williams, the essays explore doubt from the Early Church to the contemporary world. They investigate a range of questions, from the familiar 'doubting Thomas', and the more surprising 'doubting John', through the pressing concerns of the Middle Ages, the emphasis on rationalism of the Enlightenment, to the competing ideological and confessional perspectives of the modern world. This fascinating collection offers an introduction to the complex relationship between doubt, faith and the Christian Churches.